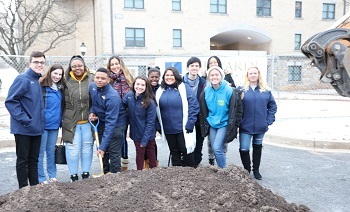 Mount St. Mary's University broke ground January 22 on a new 5,700 square foot multipurpose student venue. With the Mount’s enrollment growth over the past two years and projected future growth, more space is needed on campus for social activities and academic collaboration. The new building will open this summer, well before the start of the 2019-20 academic year. The open design building, funded in part by an anonymous donor, is flexible to accommodate weekend social activities such as concerts and other large-scale events, to providing space for meetings of student life clubs and organizations. In addition, the venue, located near Keelty Towers on the southwestern corner of John Walsh Way and Annandale Road, will include space for collaborative academic work and for commuter students to gather. The facility also has rollup doors that can be opened up in warmer weather to the patio area and lawn. As he pointed out the university’s dedication to student life activities that this facility represents, Rob Tsegaye, Student Government Association president, thanked everyone involved in this project. "Never before has student affairs been focused on this much—to the point we have our own building," he exclaimed. "This is about our students and those who come after them as we fulfill our commitment to develop ethical leaders who lead lives of significance in service to God and others," said President Timothy E. Trainor, Ph.D.
After site preparations are completed in several weeks, construction is expected to begin, according to Vice President for Business and Finance William E. Davies. 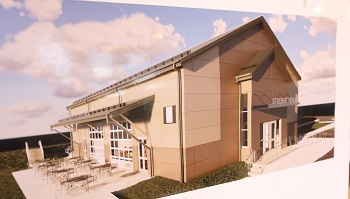 The building, designed by Marotta/Main, will be constructed by Centurion Construction Group, LLC.